Today I will share to you some tales about the Sinulog which I promise to do last weekend. Sinulog, perhaps one of the biggest and most famous festivals in the Philippines, is annually held every third Sunday of January in Cebu City. 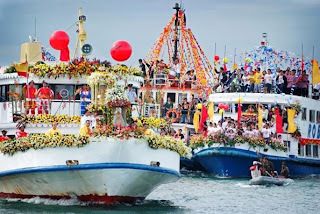 The festival honors the patron Saint of Cebu City, Santo Niño (Holy Child) or the child Jesus. Famous for its forward-background dance movement, Sinulog is a dance ritual that celebrates the natives’ acceptance of the Roman Catholic faith. The Sinulog dance movement features its infamous two steps forward and one step backward together with the beat of the drums. It is said that the dance movement is just like the water current movement, or sulog, as Cebuanos call it in their dialect; thus where the Sinulog word originates from. Since 1521 when the Portuguese explorer Ferdinand Magellan baptized the Cebuano natives and converted them to the Roman Catholic faith, the Cebuanos have shown much devotion. But the first ever Sinulog parade started on 1980, organized by then Regional Director of the Ministry of Sports, and Youth Development, David Odilao. He then turned over the event to the Cebu City Historical Committee who up to now is tasked to conceptualize the yearly Sinulog festival. Thus, Sinulog 2010 marks the 30th celebration of devotion to the Santo Niño. The Sinulog festival usually lasts for nine days, concluding on the last day with the Sinulog Grand Parade. For nine days, a lot of activities are usually held, may they be religious-related or social-related activities. Religious-related activities include the nine-day novena and masses held at the Basilica del Sto. 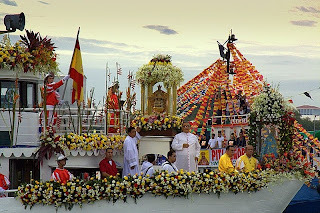 Niño church; the Fluvial Procession, which is traditionally held at dawn a day before the grand parade, starts from Mandaue City wherein a pump boat carries a statue of the Santo Niño to Cebu City wherein later that afternoon a street possession takes place; and a Pontifical Mass held on the feast day at the Basilica del Santo Niño church, which is led by the Cardinal and several other bishops of Cebu. On the other hand, social-related activities include Miss Cebu beauty pageant, one of the most prestigious beauty pageants in the country; a series of band concerts on famous hang-out places; fireworks competition at SM City – Cebu held one day before the feast day; a series of fireworks display at Club Ultima, Crown Regency, Cebu City Sports Complex; and the Grand Fireworks Finale Display, which is very popular and is now a tradition at Ayala Center Cebu. The Sinulog Grand Parade features a street parade and participants from every sector of the Cebuano community dressed in very colorful and bright costumes dancing to the tune of the drums. Because of its popularity not just in the country but all over the globe as well, Sinulog is flocked by tourists from every where. Millions of Cebuanos, tourists, public figures flood the streets of Cebu City every year to watch the parade, dance on the streets, and merely enjoy the event. Every year, the Sinulog festival just gets getting bigger, better, brighter, and more fun. This year marks Cebu's 30th year of Sinulog celebration.